Infrared thermometers are a convenient instrument to measure surface temperatures quickly and accurately without ever having to touch the object. As they are non-contact, they are ideal for performing quick spot checks of temperatures from a distance when the object’s heat is too high to get close, the target is out of reach, or when a conventional thermometer such as a probe thermometer cannot be used. IR thermometer guns are handy in a wide variety of applications, such as diagnosing automotive problems, monitoring food to comply with safety standards, checking HVAC equipment and making sure a grill plate is the ideal temperature. Whether you spend a lot of time fixing and maintaining machinery at work or you enjoy doing high precision cooking at home, a non-contact infrared thermometer can be valuable in so many situations. What Are Infrared Thermometers Used For? Q: How Does an Infrared Thermometer Work? Q: What Temperatures Do Infrared Thermometers Measure? Q: How Accurate Are Infrared Thermometers? Take a look at our list of infrared temperature gun reviews to help you choose the most suitable model for your budget and desired application. When dealing with any mechanical, automotive, electrical or HVAC repairs and maintenance, the Fluke 62 MAX Plus infrared thermometer is perfect for the job. It is small, easy to use and precise which means you can get around compact or tight spaces to measure the temperature of motors, pumps, panels, breakers, transformers, compressors, steam lines, valves, ducts, and vents. This is a reliable and durable unit that has been 3-meter drop tested, so it’s robust enough for any workspace. Plus, it has been IP54 rated to certify it is both dust and water resistant. The laser temperature gun can also be clipped to a tool belt or a storage area using a carabiner. The Fluke 62 MAX Plus boasts dual lasers to ensure precision in your measurements by helping you identify the edges of the measurement area. After taking its reading, the infrared thermometer displays the highest and lowest reading, the difference between them and the average temperature on a large backlit LCD screen. The large display makes the data easy to read, even in dark areas. The Fluke 62 MAX Plus is emissivity adjustable, and it has a 12:1 distance-to-spot ratio. The temperature measurement range is -22 to 1202°F (-30 to 650°C) and is accurate to within ± 1% in the 0 to 650°C range. For users who require an industrial-grade model for professional use in the workplace or even for those who want a durable and accurate non-contact infrared thermometer at home, the Fluke 62 MAX Plus is our top recommendation. The Etekcity 1022D is the best value for money infrared thermometer because while it has many of the same features than its competitors (in some cases it has more), it comes at a much lower price point. This infrared thermometer has a wide measurement range for lower temperatures making it ideal for use in freezers or cold spaces. Its accuracy is within ± 2% with a range of -58 to 1022°F (-50 to 550°C). The Etekcity 1022D employs dual Class 2 lasers to help you take precise measurements. The ideal distance for the lasers to get the most reliable reading is 14.17 inches (36 centimeters) from the surface or object you are measuring —this allows the two lasers to overlap and achieve the best results. And the results are fast—the IR thermometer gun will display readings in less than 0.5 seconds. The Etekcity 1022D features adjustable emissivity to allow for different surface types. Emissivity is the ability for a surface to emit thermal radiation. By knowing a surface's emissivity rating and adjusting the settings accordingly on the IR thermometer, you will acquire a far more accurate reading. A backlit LCD display on the Etekcity 1022D digital infrared thermometer means you can take it with you into dark spaces without the need to carry an additional torch or light source. The thermometer gun also has an automatic data hold function which allows you time to record your numbers after you have taken your measurement. The Etekcity 1022D infrared thermometer helps to save your battery life with its Auto-Off function and a low battery indicator. The product is immediately ready to use at purchase as it also comes packaged with a battery. The Etekcity 1022D is made with scratch resistant polished plastic, which is coated in weather and scratch resistant UV paint so it is more durable than one would expect for the price point. The Taylor Precision Products Dual Thermometer is the best infrared thermometer for cooking because it comes with both an IR thermometer device as well as an internal probe. IR thermometers on their own can only measure surface temperatures, not internal temperatures. For instance, if you turn your barbecue up to its highest setting, you can burn a steak on the outside while the inside is still raw. The best way to measure temperatures while cooking is to use the infrared thermometer (for reading the frying pan or barbecue surface) in conjunction with the included probe for the internal temperature of the food. Because of this dual capacity, the Taylor Precision Products Thermocouple is versatile enough to be helpful for precision baking, grilling, roasting or even sous vide. The probe is 5 inches of stainless steel with a step-down narrower tip. This allows the probe to accurately measure even the largest roast meat loin without releasing all the crucial juices. Taylor Precision Products infrared thermometer has a temperature range of -67 to 482°F while the probe can measure up to 626°F. The IR thermometer also has adjustable emissivity which can be important when measuring surfaces covered in oil, for example. There is also the option to press the hold setting to freeze the last recorded temperatures on the display screen. The IR thermometer comes with an auto shut off feature to help preserve battery life and operates on two AAA batteries (also included). It is splash-proof (an essential feature for around the kitchen) and quite compact in size (5.1 x 9.1 x 2 inches and weighs 4.8 ounces) which means it can fit inside the pocket of a chef’s pants or an apron comfortably. As the entry-level product in the Etekcity IR thermometer range, the Lasergrip 774 is the best cheap infrared thermometer. It is a Class 2 laser temperature gun that can measure temperatures of between -58 to 716°F (-50 to 380°C). It has a distance-to-spot ratio of 12:1 which means you can measure temperatures from a significant distance away (14.1 inches or 36 centimeters is the ideal distance between the laser temperature gun and object for best accuracy). Once you point and shoot the infrared temperature gun, the measurement comes up in less than 500 milliseconds and holds the reading on the display screen for 15 seconds. The display screen is also backlit, for ease of use when there is low light. The Etekcity’s Lasergrip 774 has a fixed emissivity setting which limits the accuracy of the device on reflective surfaces. If precision is important to you, take a look at our top recommendation—the Fluke 62 MAX Plus IR Thermometer. The 9-volt lithium ion battery is included, and a couple of features have been built into the infrared thermometer to extend and monitor battery life including an Auto-Off function and a low battery indicator. This laser temperature gun is coated in UV paint and boasts a robust external casing to keep it hardy and long-lasting. It is versatile enough to be used around the home, when conducting maintenance work, for use outside and also in the kitchen to act as an infrared laser thermometer for cooking and measuring surface temperatures. Rather than just showing you the temperature in one particular area, the FLIR TG165 spot thermal camera will show you the hot spots versus cool spots across the entirety of any surface with an easy-to-read color-coded visual display. Visual infrared thermometers are useful for scanning areas to identify hot or cold spots immediately—such as sourcing a hotspot on an electrical breaker panel or identifying equipment issues in HVAC appliances and systems. But rather than having to invest in an expensive thermal camera, the TG165 can provide the necessary data in this intuitive handheld product. With a 24:1 spot size ratio, the spot thermal camera has a temperature measuring range of -13 to 716°F (-25 to 380°C). The actual camera itself has FLIR's Innovative Lepton IR Imaging Engine with 80x60 resolution, 150mK sensitivity, and a 9hz refresh rate. You can save the data and images from the spot thermal camera on a USB or SD card and then transfer these to your computer for further analysis or send them on to other people. An 8-gigabyte micro SD card and a USB cable is included with the product. The spot thermal camera has been drop tested to 2 meters making it durable and long lasting. It is also compact, easily transportable and intuitive to use—there is no training necessary to operate the instrument. FLIR is so confident in their product that they have backed it with an impressive 10-year warranty for the infrared detector and 2-year warranty for parts and labor. What makes the 1025D laser temperature gun different from some of the others in the market is that it features voltage detection to protect you when working with electrical systems. This inbuilt safety mechanism allows you to use the non-contact voltage (NCV) mode to safely test whether there is a live AC voltage before you even touch anything. While no specific readings on voltage levels will appear, lines on the display screen will show you the approximate voltage level (high versus low). Following the sound of the steady beeping, you can move the infrared temperature gun to locate the source of the maximum voltage. The backlit LCD screen will show you temperature readings from the dual lasers that can measure between a range of -58 to 1022°F (-50 to 550°C) and has a 12:1 distance-to-spot ratio. This laser thermometer is emissivity adjustable so you can be more accurate with your measurements, no matter what surface type you are working with. The 1025D Temperature Gun operates on a 9-volt battery (included with the IR thermometer) and will save you money with its Auto-Off functionality and the low battery indicator. This handheld IR thermometer gun has an incredibly long-distance measuring range and it is one of the most accurate infrared thermometers on the market. You can be up to 50 feet away from the object you are checking and still get an accurate temperature reading. It can also measure extreme heat—much higher than many of its competitors. The Amprobe IR-750 can read temperatures of between -58 to 2822°F (-50 to 1550°C). This makes it ideal for use with industrial machinery where you can’t get up close and intimate with the equipment you are measuring. The laser temperature gun is emissivity adjustable and has a thermocouple input for even further accuracy. The display is an LCD backlit screen (which also allows it to be operational in the dark) that continuously shows the current temperature, maximum temperature, and minimum temperature. The Amprobe IR-750 updates four times a second and holds each reading for 8 seconds on the auto display. This allows you to scan for hot and cold spots across a car engine (for example). A USB port sits on the side of the Amprobe IR-750 to allow you to download data to your computer and up to 99 data points can be stored at one time. This is an all-in-one product—it comes with everything you need when you purchase it. Included are a 9-volt battery, K-type thermocouple, USB cable, software, soft carry bag, and hard plastic carry case. The dual lasers on this laser temperature gun can help you record the minimum, maximum and average temperatures of the surfaces you are trying to measure. With adjustable emissivity settings also available, the ennoLogic eT650D is designed to deliver specific and detailed temperature readings, so you know exactly what is going on. There are also high and low audible alarms that you can set to ensure the surface temperature doesn’t increase (or decrease) beyond your desired level. This laser temperature thermometer comes with a hands-free mode and a distance-to-spot ratio of 10:1. It operates on a 9-volt battery (included) and comes packed with a holster for ease of use. The display screen is backlit (perfect for use in darkened conditions) and will display temperatures between a range of -58 and 1202°F (-50 to 650°C). The laser temperature gun has an ergonomic design that allows it to sit comfortably in your hand when you use it. ennoLogic tests and packs their IR thermometers in the US and they are FDA and FCC compliant. The laser gun thermometer also comes with a 10-year warranty and a 100% money back guarantee. Reading reviews of laser thermometers can seem very technical and complicated. It can be hard to figure out what you should be considering before you decide on the best IR thermometer for you. Here are some factors to take into account. Think about how great a temperature range you need for your non-contact infrared thermometer. For instance, if you plan to use your laser thermometer purely around the home for measuring surface temperatures of your grill or your air conditioning unit, you may not need a wide temperature range. 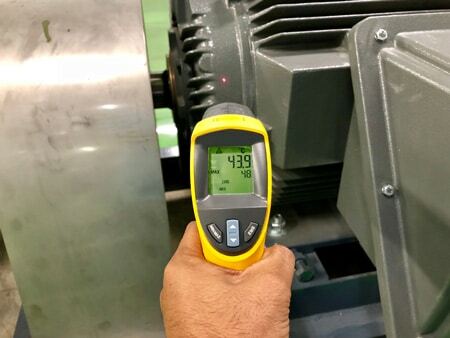 However, if you plan to use your infrared laser thermometer when working with machinery, motorized engines or in an industrial setting, then a higher temperature range may be more relevant. Precision in measurement is vital in an IR thermometer, especially when you are working with expensive machinery or in a commercial kitchen where accuracy is paramount. For example, when using a digital infrared thermometer in food safety applications, you need a specific and accurate reading every time. Check the specs on your infrared laser thermometer as the more precise it is, the better your results will be. Emissivity is the capacity of a surface to emit thermal radiation. IR temperature guns with a fixed emissivity setting of 0.95 are set to take readings of high emissivity surfaces, which means that the surface will efficiently radiate the temperature of an object. This is fine if you’re taking readings of dark matte surfaces such as asphalt, walls or tiles. Fixed emissivity settings will cause issues when measuring reflective surfaces with low emissivity ratings, for example, measuring polished metal will give false readings when the emissivity settings are not adjusted. An IR thermometer gun that features adjustable emissivity settings (between 0.10 and 1.00) will be more accurate as you can calibrate the thermometer for each surface you are measuring. The d﻿﻿istance-to-spot (D:S﻿﻿) ratio refers to the measurable surface area the infrared laser thermometer will read compared to the distance from which it takes that reading. For example, an IR thermometer with a 12:1 distance-to-spot ratio, will measure an approximately 1-inch diameter area when it is 12-inches away. The further away you are from the target the larger the measurable surface area becomes, thus impacting the accuracy of the readings if you need to measure a small space. For instance, if you want to measure a 2-inch area from 1 meter away with an IR temperature gun that has a 12:1 distance-to-spot ratio you will not get accurate results as the thermometer will also be measuring the temperature outside of the predetermined area you are trying to measure. Essentially, the distance-to-spot ratio lets you know what the ideal distance is to obtain an accurate reading. Think about how frequently and for what purpose you are using your infrared laser thermometer. The best laser thermometer for your needs may not be the most expensive. Consider which features will really provide you added value before you make your purchasing decision. Automotive—Mechanics and automotive enthusiasts can use a digital infrared thermometer to troubleshoot overheating issues and perform routine spot checks on many components, including, brakes, tires, radiators, and engine timing. HVAC—Heating and cooling professionals use infrared thermometers to perform equipment checks and to diagnose, duct leaks, insulation issues, malfunctioning coils, and other heat-related HVAC problems. Electrical systems and circuit boards—IR thermometers can be used when working with electrical systems by checking for hot spots, diagnosing potential problems and preventing equipment failure. Cooking—An infrared thermometer gun allows you to verify that your grill or stovetop are the correct temperatures before you put that precious short rib on top. Food safety—Chefs and food service managers in commercial kitchens use infrared thermometers for continuous monitoring of food to ensure temperatures are compliant with food safety standards. Manufacturing—In industrial and manufacturing applications a laser thermometer is used to monitor products for quality assurance and perform routine temperature audits of equipment to schedule repairs and prevent expensive equipment breakdowns. This includes checking temperatures of generators, conveyor belts, bearings, materials and products coming off the production line. Medical—For measuring the body temperature of humans and animals. 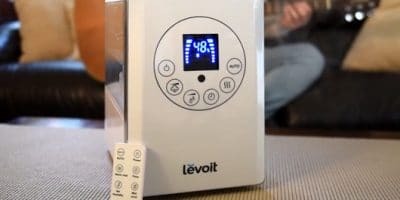 Home use—There are many uses for an IR temperature gun around the home, such as checking for poor insulation and heating and cooling problems, working on vehicles in your garage, cooking on the grill, crafting beer, baking bread from scratch, making soap and with many other hobbies or home improvement jobs. Turn on your infrared thermometer gun. Select whether you prefer your measurement to be recorded in Fahrenheit or Celsius. Read the instruction manual to ensure you are familiar with the distance-to-spot ratio of your laser thermometer. This will provide better accuracy when taking measurements. As a general rule of thumb, the closer you are to a surface, the more precise the measurement. However, bear in mind that it may not be safe to get too close to extremely hot objects. If your IR thermometer gun is emissivity adjustable, go ahead and change the emissivity to the optimal setting for the surface you are trying to measure. With the guidance of the laser, point your IR thermometer at the object you want to measure and pull the trigger to view the temperature on the display. Try to opt for a spot on your surface that is not too close to other objects of vastly differing temperatures. Do not use your infrared thermometer to measure items with highly reflective or shiny surfaces without adjusting for the emissivity. Do not try to use your IR thermometer to measure objects behind smoke or glass as the thermometer will measure the temperature of the smoke or glass instead. A: Infrared thermometers are temperature sensing instruments that are used to make non-contact measurements of surface temperatures. They work by inferring temperatures based on the thermal radiation that is emitted by a particular object. By knowing the object’s emissivity and the amount of infrared energy being emitted, the object’s apparent temperature can then be gauged. As they are non-contact, they employ the use of a laser to help users aim the thermometer, this is why they are sometimes called laser thermometers. They are commonly used in industrial applications that require quick and accurate temperature readings from a distance when the surface is out of reach, the object’s temperature is too extreme to get near, or when a probe cannot be inserted into the item being measured. A: An infrared thermometer works by using a lens to focus on the light coming from an object in the form of infrared rays and funneling it onto a detector, called a thermopile. The thermopile inside the IR thermometer absorbs the IR radiation and turns it into heat which then gets converted into electricity. The amount of electricity is measured and then displayed on the screen of the thermometer. A: IR thermometers can measure a range of temperatures from below freezing to extremely high temperatures. The range of temperature measurements available depends on each specific product. For example, our top recommendation, the Fluke 62 MAX Plus, has a measurement range of -22 to 1202°F (-30 to 650°C) with an accuracy of ± 1°C or ± 1.0% of the reading from 0 to 650°C. Typically the more expensive infrared laser thermometers have larger measurement ranges and greater distance-to-spot ratios. A: Infrared thermometers are an accurate and convenient instrument to make quick measurements of surface temperatures. The accuracy specification of an IR thermometer depends on each individual model. Most models will have a measurement error of ± 2.0%. There are also two other factors to consider that will dictate the accuracy of an IR thermometer’s readings. These are the distance-to-spot ratio of the IR thermometer and the emissivity of the target. A thermometer with a higher distance-to-spot ratio will be able to measure a smaller surface area at a greater distance than one with a lower ratio. The ideal target area should be at least twice the size of the measuring spot at that distance. Otherwise, it can impact on the accuracy of the measurements. Many infrared thermometers also come with adjustable emissivity settings which allows you to calibrate the device to take into account a surface’s emissivity (an object’s ability to emit its own infrared radiation). Adjusting the emissivity setting of your infrared temperature gun according to the type of surface you are analyzing ensures that your measurements will be more precise. A: IR thermometers only measure surface temperature, so they cannot accurately gauge the internal temperature of the food you’re cooking. On its own, an infrared thermometer cannot tell you the doneness of meats. You should use a traditional temperature probe to determine the internal temperatures of foods. We recommend the Taylor Precision Dual Thermometer which comes with an IR thermometer as well as a probe to measure internal food temperatures. However, an infrared thermometer gun is very helpful for measuring the surface temperature of hot oil, a cast iron skillet, a sauté pan or your barbecue grill. Just remember when taking the temperature of a grill the thermometer will factor in the temperatures of the surfaces that are visible through the grate. To obtain an accurate reading, try placing a solid surface such as a cast iron plate or skillet on the grill and let it preheat for 5-10 minutes, then spray the surface with a little bit of cooking oil for proper emissivity and proceed to take the temp of the plate or skillet. A: Regularly checking the accuracy of any measuring instrument is vital to ensure your device is in good working order. An easy way to calibrate an infrared thermometer is to make a crushed ice and water mix in a bath. You want this to be a slurry consistency to ensure that you’re measuring a uniform temperature that is as close to 0°C as possible. Then measure the ice and water mix to check your infrared thermometer’s accuracy. Another solution is to use an infrared comparator cup. A comparator cup provides a solid matte black base with a high emissivity rating for accurate readings. You can use the cup to compare the measurements from the infrared thermometer with a reference thermometer that has been calibrated. The advantage of using a comparator cup is that you can test a range of temperatures and you will have greater confidence in the results. A digital infrared thermometer is a useful tool in any workshop, factory floor, commercial kitchen or household because it can help you measure surface temperatures quickly, accurately and safely from a distance. Whether you’re fixing a car, diagnosing HVAC equipment or measuring the barbecue grill before you cook up a feast, an IR thermometer gun is a convenient, non-invasive instrument to help you analyze temperatures. For professional use, the Fluke 62 MAX Plus IR Thermometer is the best temperature gun because it is an accurate and robust all-rounder with a broad measuring range, a 12:1 distance-to-spot ratio, adjustable emissivity settings, and dual lasers to help you pinpoint the edges of the measurement area. Built to withstand a 3-meter drop and with an IP54 rating for dust and water resistance, you can rely on the Fluke 62 Max Plus to provide accurate measurements on even the toughest and dirtiest job sites. If you’re looking for a more affordable model for use around the home or for working on your own personal vehicle, we recommend the Etekcity 1022D Dual Laser Digital Infrared Thermometer as the best value for money option. After reviewing the best laser thermometers on the market, two models stood out above the rest. Our top recommendation is the Fluke 62 MAX Plus, its accurate, robust, and reliable, making it the perfect model for professional users. For a more affordable option for around the home, we recommend the Etekcity 1022D. Hey, I'm Erik, a tech blogger residing in Reno, Nevada. I specialize in writing about the latest gadgets and technology trends. I recently discovered a fascination for meteorology after my wife bought me an Ambient Weather station for my 31st birthday. 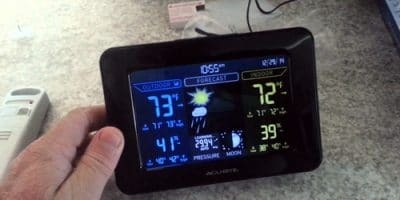 Here at Weather Station Advisor, I combine my unhealthy obsession with technology and my newfound interest in the weather to bring you the lowdown on the latest weather instruments to hit the market.